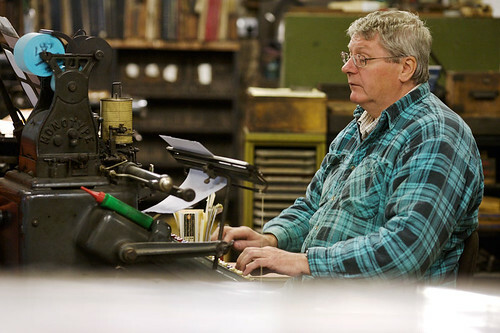 Neil Winter demonstrates the art and science of the Monotype as he prepares galleys of hot metal type at Whittington Press, which continues to print by letterpress using a working keyboard and caster from the 1960s. 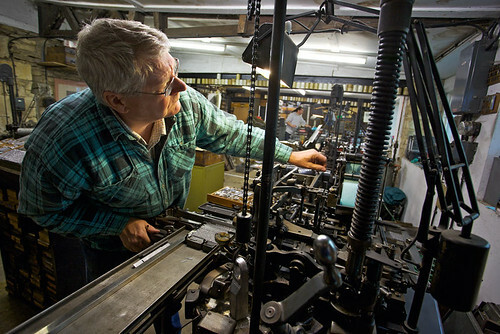 Neil Winter operates the Monotype caster, manufactured in the late 1960s, at John Randle’s Whittington Press near Cheltenham in the UK. 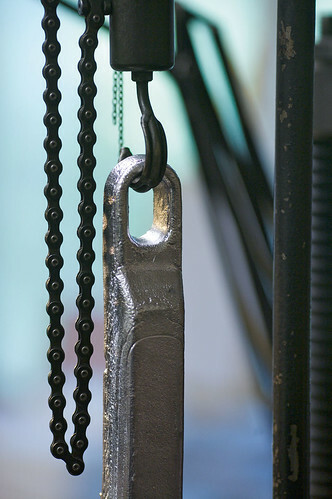 In the foreground an ingot hangs from the chain that lowers it into the caster’s melting pot. 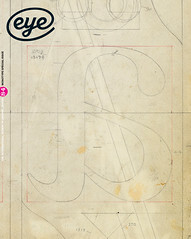 Top: A matrix case for 8-point Bodoni. 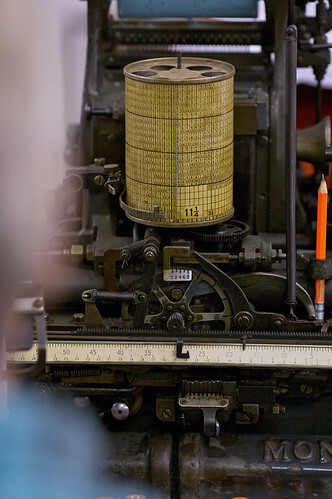 Each case has a fifteen by fifteen grid which holds up to 225 brass matrices for the characters to be cast. 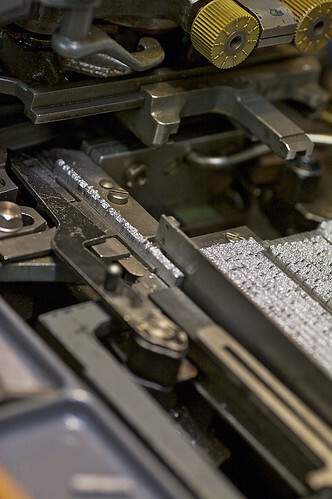 The case is inserted into the caster face down, and each piece of type is cast from a molten alloy. Words are set on a keyboard. 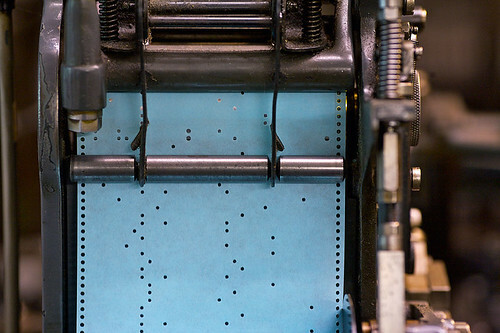 Keystrokes and hyphenation and justificationsettings are saved as coded perforations on a paper spool. Text mistakes cannot be corrected until the type is cast. Winter sets the type, reading from a marked-up manuscript. The orange keys at the top of the QWERTY keyboard are used to set the justification at the end of each line. 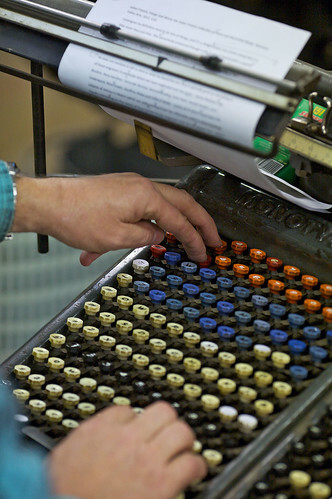 Behind the ‘button banks’ of the keyboard is a set of ‘key-bars’ corresponding to the typeface to be cast. Whittington’s keyboard dates from the mid-1960s. 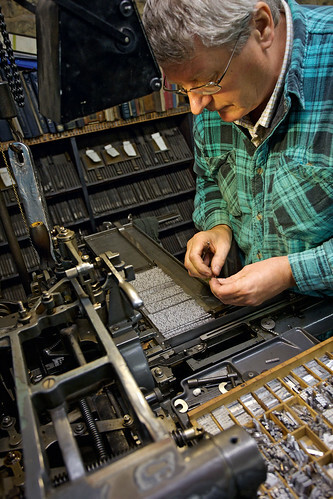 Each keystroke is encoded as perforations in a four-inch wide paper spool. 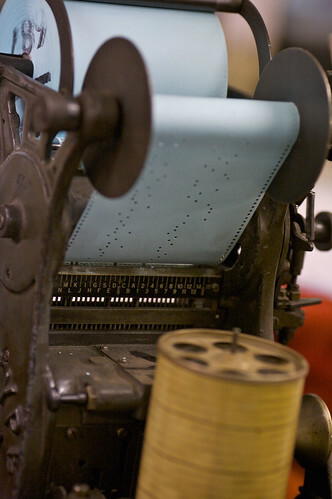 The perforations encode a series of coordinates that controls the caster and matrix mechanism, like the perforated paper spool in a player piano. Winter replaces some of the characters with special type characters (such as accented type or particular ligatures) not available in the matrix. A line of freshly cast single types and spaces emerges to join the galley. 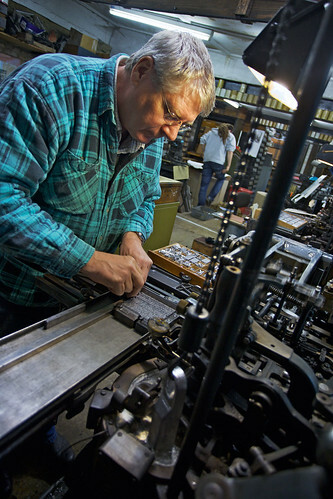 Winter makes final adjustments to the completed galley of freshly cast type at Whittington Press. ‘I’m doing three jobs at once. Ultimately I’m the keyboard operator, caster and compositor,’ says Winter. 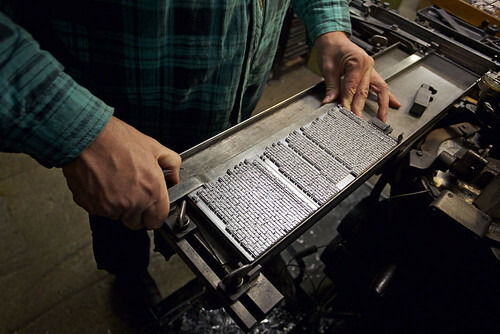 A finished galley, set in 12-point Caslon. 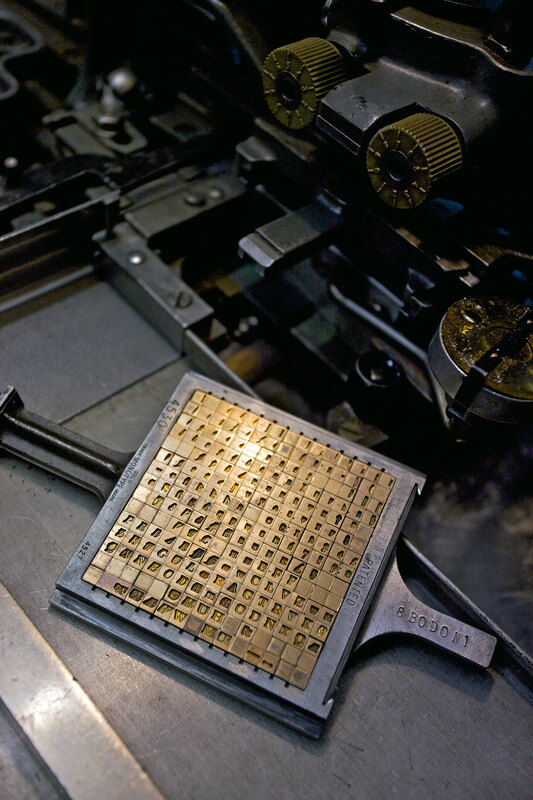 After the job is printed, the type is melted down and cast as ingots, ready to be used again. 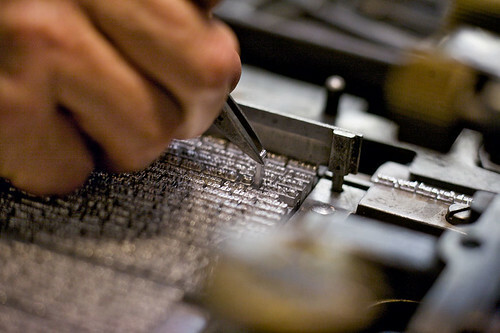 Winter: ‘Using the Monotype is more hands on, and much more of a craft than using a computer to set type.